Sheikha Hoor Al Qasimi is President and Director of Sharjah Art Foundation. Recent curatorial projects include Hassan Sharif: I Am The Single Work Artist (2017–2018); Yayoi Kusama: Dot Obsessions (2016–2017); Robert Breer: Time Flies (2016–2017); Farideh Lashai (2016); Simone Fattal (2016); 1980–Today: Exhibitions in the United Arab Emirates, UAE National Pavilion, Venice Biennale (2015); Rasheed Araeen: Before and After Minimalism (2014); Wael Shawky: Horsemen Adore Perfumes and other stories (2014) and Susan Hefuna: Another Place (2014). Al Qasimi was co-curator for the travelling exhibition Joana Hadjithomas and Khalil Joreige: Two Suns in a Sunset (2016) and a number of major surveys, including Ahmed Morsi: A Dialogic Imagination (2017) and The Khartoum School: The Making of the Modern Art Movement in Sudan (1945–present) (2016–2017). In 2003, she was appointed curator of Sharjah Biennial 6 and has since continued as the Biennial Director. Al Qasimi is President of the International Biennial Association; Chair of the Advisory Board for the College of Art and Design, University of Sharjah and a member of the advisory boards for the Khoj International Artists’ Association, New Delhi and Darat al Funun, Amman. She also serves on the boards of MoMA PS1, New York; Kunst-Werke Berlin and Ashkal Alwan, Beirut. She is Visiting Lecturer at Slade School of Fine Art, London and Scholar-in-Residence at the Institute for Comparative Modernities, Cornell University, Ithaca, US. She has served on juries for the Prince Claus Award Committee (2016–present), Bonnefanten Award for Contemporary Art (2018), Maria Lassnig Prize (2017), Hepworth Wakefield Prize (2016), Benesse Prize (2013) and the Berlinale (2012). Solange Oliveira Farkas is a curator based in São Paulo, Brazil whose work has provided a platform for contemporary video art with a focus on the global south. She has a strong interest in the influence of video as an art form and the relationship between video and other mediums. Farkas is chief curator and general director of the Contemporary Art Festival SESC_Videobrasil, which she founded in 1983. She has also curated shows for FUSO–Video Art Annual International Exhibition, Lisbon (2011–2014 and 2017); Dak’Art–Biennial of Contemporary African Art, Senegal (2016); 6th Jakarta International Video Festival (2013); Sharjah Biennial 10 (2011); 16th Cerveira Biennial, Portugal (2011); Joseph Beuys: We Are the Revolution, Sesc Pompeia, São Paulo and Museu de Arte Moderna da Bahia, Salvador, Brazil (2010–2011); Roteiro Amarrado [Tied-up script], CCBB, Rio de Janeiro (2010); Sophie Calle – Cuide de você [Take care of yourself], Sesc Pompeia, São Paulo and Museu de Arte Moderna da Bahia, Salvador (2009) and Suspensão e Fluidez, ARCO, Madrid (2007). Farkas was the recipient of the Montblanc de la Culture Arts Patronage Award (2017), and she is a member of the jury committee for the EYE Art & Film Prize, Amsterdam, a member of the prize committee for the Prince Claus Fund Award and on the consulting board of Pivô, an art space in São Paulo. She served as a guest juror at the 10th Rencontres de Bamako, African Photography Biennial, Mali (2015). Zeynep Öz is an independent curator based in Istanbul whose interests lie in the field of artistic production. She co-founded SPOT Contemporary Art Projects in Istanbul in 2011 and is the curator of Produce. Among Öz’s curatorial projects are the off-site project BAHAR for Sharjah Biennial 13, Istanbul (2017); Aichi Triennale 3 (2016); Produce III: The Game Settled into a Cagey Midfield Match, SPOT Production Fund, Istanbul (2016); Greatest Common Factor, SALT, Istanbul (2016); Produce II: Anybody Could Be a Sculptor One Day, SPOT Production Fund, Istanbul (2014); Plastic Veins, Home Works 6, Beirut (2013); Selling Snails in the Muslim Neighborhood, Westfälischer Kunstverein, Münster, Germany (2013) and Produce I: Change Will Be a Sculptor, SPOT Production Fund (2012). Öz has also developed curatorial and artistic projects at the Reginald F. Lewis Museum, Baltimore, US; Maryland Historical Society, Baltimore and Frankfurter Kunstverein, among others. The Production Programme furthers the foundation’s goal of broadening the possibilities to produce art in the MENASA region through the support of innovation and excellence in artistic practice and the encouragement of risk-taking and experimentation. Since the launch of the Production Programme in 2008, over 1000 submissions have been received, over 500 applications considered and 55 projects selected for production and presentation. The programme cycle is every two years, with an open call announced in the autumn and the decisions announced in the spring after submissions are reviewed and projects selected by an international jury. One of Sharjah Art Foundation’s core initiatives, the Production Programme works to engage and challenge artists and audiences aesthetically, intellectually, emotionally, socially and politically in new and unexpected ways. Previous Production Programme grantees include Bani Abidi, Marwa Arsanios, Elena Artemenko, CAMP, Ahmad Ghossein, Sean Gullette, Jumana Manna, Mario Rizzi, Zineb Sedira, Lindsay Seers and Raed Yassin. Among the commissions for the foundation’s Production Programme are Jumana Manna’s film A Magical Substance Flows into Me, presented as part of her solo exhibition at Chisenhale Gallery; Ahmad Ghossein’s film The Fourth Stage, presented at Sharjah Biennial 12; Ali Cherri’s The Digger, which premiered at the CPH:DOX festival in Copenhagen; works by Bani Abidi and CAMP, which were presented at dOCUMENTA 13, and the film Traitors by Sean Gulette, which premiered at the Venice Film Festival in 2013. 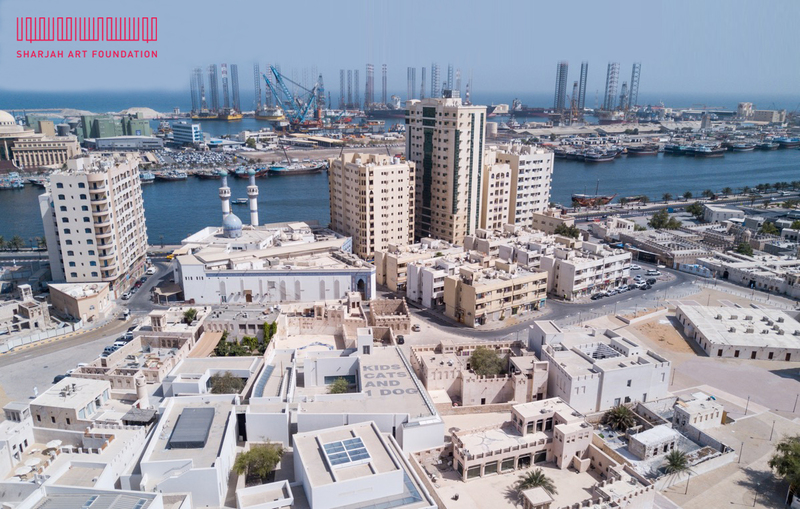 The Sharjah Art Foundation is an advocate, catalyst and producer of contemporary art within the Emirate of Sharjah and the surrounding region, in dialogue with the international arts community. Under the leadership of founder Hoor Al Qasimi, a curator and artist, the foundation advances an experimental and wide-ranging programmatic model that supports the production and presentation of contemporary art; preserves and celebrates the distinct culture of the region; and encourages a shared understanding of the transformational role of art. The foundation’s core initiatives include the long-running Sharjah Biennial, featuring contemporary artists from around the world; the annual March Meeting, a convening of international arts professionals and artists; grants and residencies for artists, curators, and cultural producers; ambitious and experimental commissions; and a range of traveling exhibitions and scholarly publications. Established in 2009 to expand programs beyond the Sharjah Biennial, which launched in 1993, the foundation is a critical resource for artists and cultural organizations in the Gulf and a conduit for local, regional and international developments in contemporary art. The foundation’s deep commitment to developing and sustaining the cultural life and heritage of Sharjah is reflected through year-round exhibitions, performances, screenings and educational programs in the city of Sharjah and across the Emirate, often hosted in historic buildings that have been repurposed as cultural and community centers. A growing collection reflects the foundation’s support of contemporary artists in the realisation of new work, and its recognition of the contributions made by pioneering modern artists from the region and around the world. Sharjah Art Foundation is a legally independent public body established by Emiri Decree and supported by government funding, grants from national and international non-profits and cultural organisations, corporate sponsors and individual patrons.